Pastor Mike and his wife Bev Preston moved from Guernsey, where they had pastored for 6 years, to Chelmsford in March 2009. 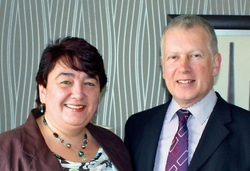 In January 2012 they moved to Kilsyth to serve the Church of God. Both Pastor Mike and Bev have a background in the Finance Industry having both worked in Offshore Banking until their move to the UK. Their ministry is - “the equipping of the saints for the work of ministry, for the edifying of the body of Christ.” (Ephesians 4:12). Providing great life application teaching, practical advice, pastoral care and identification and releasing of people into their giftings are their primary skill sets. Pastor Mike has a real heart for the church to impact the community with the message of Hope, which is the Gospel of Jesus Christ, through words and actions.